We are a chief Manufacturer, Exporter & Supplier of Vertical Drilling Machine (SI-3M). Loaded with features like sturdiness, long working life, efficient performance and high functionality, the Vertical Drilling Machine (SI-3M) is extensively demanded in the worldwide market. 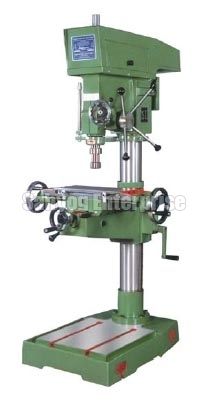 Clients can avail quality tested Vertical Drilling Machine (SI-3M) from us at economical rates. Proportioned Column for rigidity of Machine. Rough & Smooth feed available by manual and power feed. Quill Spacer made of mild steel. Main Spindle made on EN steel with 6 slots 8 speed in either direction. Major parts casting are of standard grade. Head stock is bored on imported boring machine.